I first heard Kelly Vincent’s unique husky voice on ABC Radio Adelaide 8 years ago when she was interviewed about the degree of difficulty she had been encountering with the Government while trying to get a new wheelchair, having outgrown her child-sized wheelchair. The radio community (including myself) found Kelly to be immediately likeable and rallied together to support her. I wondered if Kelly’s new adult wheelchair was possibly fast tracked by the Government due to the high degree of media exposure and community support. This was the start of Kelly Vincent getting results from the Government and is now continuing her advocacy work as Member for the Legislative Council in the Parliament of South Australia. Kelly’s background in playwriting and acting has given her the confidence and ability to articulate the problems facing people with disabilities, and their family carers. She supports radical change for the needs of people with disabilities and believes that the biggest thing that needs to shift is peoples attitudes towards disability. Kelly has ensured that universal design principles are considered in the state planning law. Trailblazing into parliament as a fresh faced 21 year old, Kelly has grown into her role as a parliamentarian over the last 7 years with great respect from the community, her colleagues and also the media! She’s the youngest woman elected to an Australian parliament, the first elected on a disability rights platform, she is Leader of the Dignity Party and I hope she gets elected again next year! Last night I attended the 2016 Election Q+A hosted by Women in Media at the Advertiser and listen to the above women speak on politics and being a woman in politics. You may know that this topic is close to my heart and my recent work so I just had to feature them as today’s Wednesday’s Women. The panel of women was diverse with two women running for the Senate and two for the House of Representatives and across the two major and the two (major) minor parties. My recent exhibition “let us be up and doing” showcased women from South Australia who are former politicians but had achieved a major milestone, like first or longest. Last nights panel, if all elected, would still be ground breaking; Rebekha Sharkie would be the first woman to win the seat of Mayo; Kerrynne Liddle would be the first Aboriginal woman from South Australia to enter the Senate; Kate Ellis will continue as an MP, her 13th year and Sarah Hanson-Young will continue on as a Senator, her 9th year. I chose last night as a good night to start my petition, “A Plead to Lead by example, Respect from the top down. Politicians quit bully behaviour.” In the footsteps of Mary Lee who travelled the colony (SA) in 1894 gaining 11,600 signatures for her petition to give women the right to vote, I plan to do the same with the above petition as I travel my exhibition around SA in the coming months. I was very pleased our leaders last night started off the handwritten petition with many of the media women signing on too. If you would like to sign the petition which will be presented to State and Federal Parliament, you can either catch me on the road or sign the digital petition here…. I wish all the women all the best in the election, be up and doing! No featured woman today, just some shameless publicity for the “let us be up and doing” exhibition! Hello….this is me modelling (different!) the fabulous t-shirt. I would like to announce that my public art exhibition “let us be up and doing” will be back up and doing by popular demand. Kindly supported by a grant from the Government of South Australia. It was Rosemary Crowley’s passion for sport, women and health which made her ‘run’ for the Federal Senate in 1983 and represent the people of South Australia. It was a good sprint because she got in and became the first woman from the Labor Party in South Australia to do so. Rosemary got to work and contributed to health care reforms with the implementation of Medicare, conducted an enquiry into ‘women, sport and the media’ and became the Minister for Family Services and Minister Assisting the Prime Minister for the Status of Women and then retiring at the end of her term in 2002, a good innings. The progress she made with improving funding and recognition for women in sport led to the Prime Ministers Cup for Netball and the Premiers Cup for Women’s Sport. She’s proud of the recent wins women’s sport is receiving in the media particularly in regard to the non-traditional sports like Cricket, Soccer and Football. Not to forget Netball, the long serving women’s sport men have been participating in and enjoying themselves! These days, Rosemary is using yoga to keep her active, flexible, mentally fit and wickedly funny! “Just me and my tall skinny mate” Susan Ley responded by showing her protective gun to a man asking “is it just you here” as he stopped by her roadside camp in the middle of the night. Sussan was in her early 20’s and on her way to her first official job as a pilot to muster cattle. I love this story Sussan recounts on the ABC’s Conversations with Richard Fidler. Here is the Link –http://www.abc.net.au/local/stories/2015/09/25/4319520.htm We hear how she’s not afraid, not prepared to let go of her dreams and what she has achieved to get where she is today, a Cabinet Minister in the Federal Government. When Sussan was 19, she needed to find $15,000 to get her commercial pilots licence and worked three jobs to do it. She had a dream to fly, but it was more than just flying, she was fascinated with the mechanics of the machine, hence her distain for gliders! Flying didn’t come easy to Sussan, on her first flight she had air sickness and says “she wasn’t very good at it”! However, she was disciplined and persisted, getting her pilot’s licence and then going onto air traffic control. Not satisfied with working in air traffic control, Sussan wrote to all the commercial airlines looking for work as a pilot. With no job opportunities there she went onto study aerial stock mustering which lead to her first job. There are many more stories to tell about Sussan Ley with such an unusual and diverse background but the main point is Sussan is not afraid to stand up for herself, to work hard and never give up. I produced this artwork in response to the 2013 change of government led by Tony Abbott when only 1 woman was appointed to cabinet. This was very disappointing after the highs of the previous government led by Australia’s first female Prime Minister, Julia Gillard with 8 female ministers including 5 in cabinet. Can you imagine if the tables were turned and there was only one man in cabinet, it would never happen! 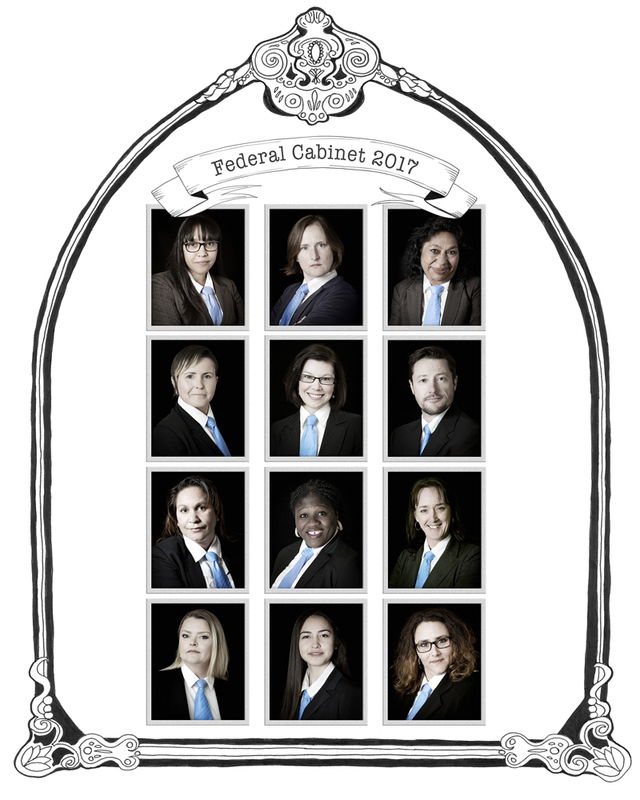 Thankfully, it’s no longer a deficit problem, this week more women have been promoted to the cabinet and ministry positions. The amount now is equally proportional to the amount of women in the Coalition, about 25%. Quite an achievement just needed a swift change in Prime Ministers! Now women are back on par with the Labor Governments representation…..is this artwork null and void? Well it’s not 50% yet! 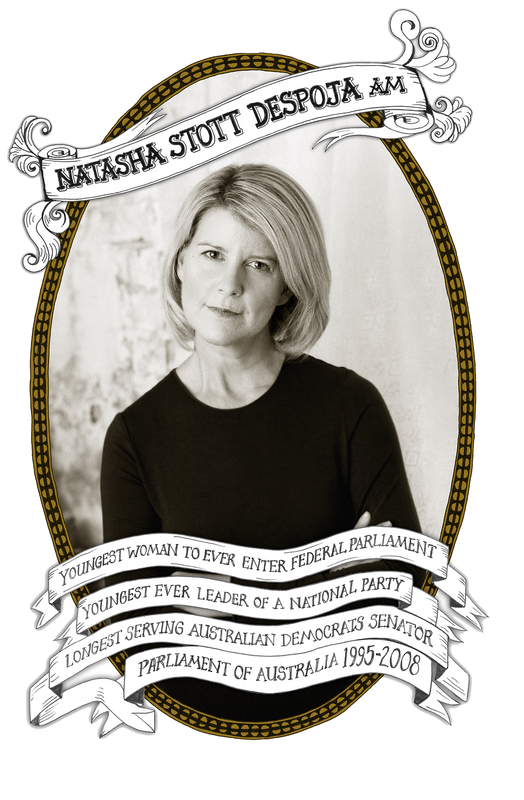 Party indeed, for today is Natasha Stott Despoja’s birthday, the 9th of the 9th ! As a fellow member of the double numbers club (I am the 1st of the 1st) I am programmed to remember Natasha’s birthday! Not shy of parties, Natasha was the party leader for the Australian Democrats from April 2001 to August 2002. It was during this time I first met and photographed Natasha for an exhibition titled ‘Look at us Now’ for the Centenary of Federation. A female political party leader in the 100th year of Australia’s Federation – how very apt! As I was led into Natasha’s office to set up my equipment I noticed that she was on the office phone, sending a text message and having work handed to her all at the same time. All this business and multitasking with enough room left for a smile at me! I have since photographed Natasha numerous times socially and for exhibitions and she has always been willing, helpful and friendly. I have an active interest in politics and I have never heard or read a bad word about Natasha Stott Despoja. I feel like I have just written a referee letter for a job application, perhaps the job of Prime Minister……aha!